aid of which they have made themselves accessible to our senses. It is assuredly important to add to the great number of fixed stars that up to now men have been able to see by their natural sight, and to set before the eyes innumerable others which have never been seen before and which surpass the old and previously known [stars] in number more than ten times. It is most beautiful and most pleasant to the sight to see the body of the moon, distant from us by nearly sixty semidiameters of the earth, as near as if it were at a distance of only two and a half of these measures. Any one can know with the certainty of sense-perception that the moon is by no means endowed with a smooth and polished surface, but with a rough and uneven one, and, just like the face of the earth itself, is everywhere full of enormous swellings, deep chasms and sinuosities. Then to have settled disputes about the Galaxy or Milky Way and to have made its essence manifest to the senses, and even more to the intellect, seems by no means a matter to be considered of small importance; in addition to this, to demonstrate directly the substance of those stars which all astronomers up to this time have called nebulous, and to demonstrate that it is very different from what has hitherto been believed, will be very pleasant and very beautiful. it and sometimes follow it, but never depart from it beyond certain limits. All this was discovered and observed a few days ago by means of the perspicilli invented by me through God's grace previously illuminating my mind. No wonder that the Message of the Stars was, at first, received with misgivings and incredulity, and that it played a decisive part in the whole subsequent development of astronomical science, which from now on became so closely linked together with that of its instruments that every progress of the one implied and involved a progress of the other. One could even say that not only astronomy, but science as such, began, with Galileo's invention, a new phase of its development, the phase that we might call the instrumental one. stars, as well fixed as errant, when they are seen through the perspicillum, are never seen to increase their dimensions in the same proportions in which other objects, and the moon itself, increase in size. Indeed in [the case of] the stars this increase appears much smaller, so that a perspicillum which, for instance, is powerful enough to magnify all other objects a hundred times will scarcely render the stars four or five times larger. But the reason for it is this: namely the stars, when seen by our free and natural eyesight, do not present themselves to us with their real and, so to say, naked size, but are surrounded by a certain halo and fringed with sparkling rays, particularly so when the night is already advanced; therefore they appear much larger than [they would] if they were stripped of these adventitious fringes; for the angle of vision is determined not by the primary body of the star; but by the brightness that surrounds it. The perspicillum acts in the same way. First it removes from the stars the accidental and adventitious splendours, and [only] then enlarges their true globes (if indeed they are of a round shape), and therefore they appear to be magnified in a smaller proportion [than other objects]. Thus a starlet of the fifth or the sixth magnitude seen through a perspicillum is shown only as of the first magnitude. from these examples you may judge about the rest. 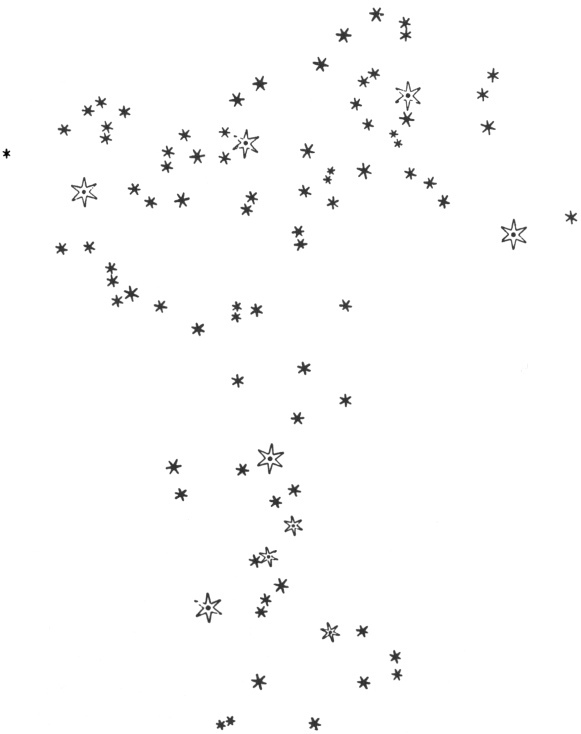 At first we determined to depict the entire constellation of Orion, but we were overwhelmed by the enormous multitude of stars and by lack of time, and have deferred this attempt to another occasion; for there are adjacent to, or scattered around, the old ones more than five hundred [new ones] within the limits of one or two degrees. As a second example we have depicted the six stars of Taurus, called the Pleiades (we say six, because the seventh is scarcely ever visible), which are enclosed in the sky within very narrow boundaries, and near which are adjacent more than forty other visible ones, none of which is more than half a degree distant from the aforesaid six. We have already seen that the invisibility for the human eye of the fixed stars discovered by Galileo, and, accordingly, the role of his perspicillum in revealing them, could be interpreted in two different ways: it could be explained by their being (a) too small to be seen, (b) too far away. The perspicillum would act in the first case as a kind of celestial microscope, in enlarging, so to say, the stars to perceivable dimensions; in the second it would be a " telescope " and, so to say, bring the stars nearer to us, to a distance at which they become visible. The second interpretation, that which makes visibility a function of the distance, appears to us now to be the only one possible. Yet this was not the case in the seventeenth century. As a matter of fact both interpretations fit the optical data equally well and a man of that period had no scientific, but only philosophical, reasons for choosing between them. And it was for philosophical reasons that the prevailing trend of seventeenth century thinking rejected the first interpretation and adopted the second. If it is true, as is commonly held,8 that the highest parts of the universe are reserved for the habitation of substances more pure and perfect [than ourselves] they [the fixed stars] will be no less lucid and resplendent than the sun; and yet their light, and I mean the light of all of them taken together, does not come up to the tenth part of the visible magnitude and of the light that is communicated by the sun; and of the one as well as of the other of these effects the sole reason is their great distance: how great therefore must we not believe it to be? from whichever point of the universe you may want to choose.
. . . nor any one in the world, knows, nor can possibly know, not only what is the shape [of the firmament] but even whether it has any figure at all. Salv.—Now, Simplicius, what shall we do with the fixed stars? Shall we suppose them scattered through the immense abysses of the universe, at different distances from one determinate point; or else placed in a surface spherically distended about a center of its own, so that each of them may be equidistant from the said center? the sphere of the universe, containing within it the circles of the planets already by us described. Salv.—But now we have all this while, Simplicius, disposed the mundane bodies exactly according to the order of Copernicus. . . .
We can assuredly explain the moderation of Salviati, who does not criticize the conception presented by Simplicio—though he does not share it—and who accepts it, for the purpose of the discussion, as agreeing perfectly with Copernican astronomy, by the very nature of the Dialogue: a book intended for the "general reader," a book which aims at the destruction of the Aristotelian world-view in favor of that of Copernicus, a book which pretends, moreover, not to do it, and where, therefore, subjects both difficult and dangerous are obviously to be avoided.
. . . absolutely impossible that there should be an infinite space superior to the fixed stars, for there is no such place in the world; and if there were, the star there situated would be imperceptible to us. the magnitude of the stellar sphere would be proportionate to that of the orbis magnum, if this one, in respect to the universe, were rather smaller than a grain of millet in respect to it? Neither you nor any one else has ever proved that the world is finite and figurate or else infinite and interminate. Many and subtle reasons are given for each of these views but none of them, to my mind,' leads to a necessary conclusion, so that I remain in doubt about which of the two answers is the true one. There is only one particular argument of mine that inclines me more to the infinite and interminate than to the terminate (note that my imagination is of no help here since I cannot imagine it either finite or infinite): I feel that my incapacity to comprehend might more properly be referred to incomprehensible infinity, rather than to finiteness, in which no principle of incomprehensibility is required. But this is one of those questions happily inexplicable to human reason, and similar perchance to predestination, free-will and such others in which only Holy Writ and divine revelation can give an answer to our reverent remarks. his own condemnation in 1633 incited him to practise the virtue of prudence: he never mentions Bruno, either in his writings or in his letters; yet it is also possible—it is even quite probable—that this problem, like, generally speaking, the problems of cosmology or even of celestial mechanics, did not interest him very much. Indeed he concentrates on the question: a quo moventur projecta? but never asks: a quo moventur planetae? It may be, therefore, that, like Copernicus himself, he never took up the question, and thus never made the decision—though it is implied in the geometrization of space of which he was one of the foremost promoters—to make his world infinite. Some features of his dynamics, the fact that he never could completely free himself from the obsession of circularity—his planets move circularly around the sun without developing any centrifugal force in their motion—seem to suggest that his world was not infinite. If it was not finite it was probably, like the world of Nicholas of Cusa, indeterminate; and it is, perhaps, more than a pure contingent coincidence that in his letter to Liceti he uses the expression also employed by Cusa: interminate. Be this as it may, it is not Galileo, in any case, nor Bruno, but Descartes who clearly and distinctly formulated principles of the new science, its dream de reductione scientiae ad mathematicam, and of the new, mathematical, cosmology. Though, as we shall see, he overshot the mark and by his premature identification of matter and space deprived himself of the means of giving a correct solution to the problems that seventeenth century science had placed before him. real about which our clear and distinct ideas give us a certain and evident knowledge. There is nothing else in this world but matter and motion; or, matter being identical with space or extension, there is nothing else but extension and motion. The famous Cartesian identification of extension and matter (that is, the assertion that "it is not heaviness, or hardness, or color which constitutes the nature of body but only extension,"16 in other words, that "nature of body, taken generally, does not consist in the fact that it is a hard, or a heavy, or a colored thing, or a thing that touches our senses in any other manner, but only in that it is a substance extended in length, breadth and depth," and that conversely, extension in length, breadth and depth can only be conceived—and therefore can only exist—as belonging to a material substance) implies very far-reaching consequences, the first being the negation of the void, which is rejected by Descartes in a manner even more radical than by Aristotle himself. substance or matter, a "subtle" matter, a matter that we do not sense—that is precisely why people who are accustomed to imagining instead of thinking speak of void space—but nevertheless a matter just as real and as "material" (there are no degrees in materiality) as the "gross" matter of which trees and stones are made. The space or the interior locus, and the body which is comprised in this space are not distinct except in our thought. For, as a matter of fact, the same extension in length, breadth and depth that constitutes space, constitutes also body; and the difference between them consists only in this, that we attribute to body a particular extension, which we conceive to change place with it every time that it is transported, and that we attribute to space an [extension] so general and so vague, that after having removed from a certain space the body which occupied it, we do not think that we have also transported the extension of that space, because it seems to us that the same extension remains there all the time, as long as it is of the same magnitude, of the same figure and has not changed its situation in respect to the external bodies by means of which we determine it.
. . . it will be easy to recognize that the same extension that constitutes the nature of body constitutes also the nature of space so that they do not differ in any other way than the nature of the gender or of the species differs from the nature of the individual.
. . . we shall find that the true idea we have of it consists in this alone, that we perceive distinctly that it is a substance extended in length, breadth and depth. But just that is comprised in the idea we have of space, not only of that which is full of bodies, but also that one which is called void.
. . . the words "place" and "space" do not signify anything which differs really from the body that we say to be in some place, and denote only its magnitude, its figure and the manner in which it is situated among other bodies. supposed to be void: namely that, as there is in it some extension, there is necessarily also some substance. The second important consequence of the identification of extension and matter consists in the rejection not only of the finiteness and limitation of space, but also that of the real material world. To assign boundaries to it becomes not only false, or even absurd, but contradictory. We cannot posit a limit without transcending it in this very act. We have to acknowledge therefore that the real world is infinite, or rather—Descartes, indeed, refuses to use this term in connection with the world—indefinite. We recognize moreover that this world, or the entirety of the corporeal substance, has no limits in its extension. Indeed, wherever we imagine such limits, we always not only imagine beyond them some indefinitely extended spaces, but we even perceive them to be truly imaginable, that is, real; and therefore to contain in them also the indefinitely extended corporeal substance. This because, as we have already sufficiently shown, the idea of this extension which we conceive in such a space is obviously identical with that of the corporeal substance itself. There is no longer any need to discuss the question whether fixed stars are big or small, far or near; more exactly this problem becomes a factual one, a problem of astronomy and observational technics and calculation. The question no longer has metaphysical meaning since it is perfectly certain that, be the stars far or near, they are, like ourselves and our sun, in the midst of other stars without end. worlds should be; and we do not find in ourselves the idea of any other matter. The infinity of the world seems thus to be established beyond doubt and beyond dispute. Yet, as a matter of fact, Descartes never asserts it. Like Nicholas of Cusa two centuries before him, he applies the term "infinite" to God alone. God is infinite. The world is only indefinite. The idea of the infinite plays an important part in the philosophy of Descartes, so important that Cartesian-ism may be considered as being wholly based upon that idea. Indeed, it is only as an absolutely infinite being that God can be conceived; it is only as such that He can be proved to exist; it is only by the possession of this idea that man's very nature—that of a finite being endowed with the idea of God—can be defined. We must never dispute about the infinite, but only hold those things to which we do not find any limit, such as the extension of the world, the divisibility of the parts of matter, the number of stars, etc., to be indefinite. Thus we shall never burden ourselves with disputes about the infinite. Indeed, as we are finite, it would be absurd for us to want to determine anything about it, to comprehend- it, and thus to attempt to make it quasi-finite. Therefore we shall not bother to answer those who would inquire whether, if there were an infinite line, its half would also be infinite; or whether an infinite number would be even or odd; and such like; because about them nobody seems to be able to think except those who believe that their mind is infinite. As for us, in regard to those [things] to which in some respects we are not able to assign any limit, we shall not assert that they are infinite, but we shall consider them as indefinite. Thus, because we cannot imagine an extension so great that a still greater one could not be conceived, we shall say that the magnitude of possible things is indefinite. And because a body cannot be divided into so many parts that further division would not be conceivable, we shall admit that quantity is indefinitely divisible. And because it is impossible to imagine such a number of stars that we should believe God could not create still more, we shall assume that their number is indefinite. positively that there are none; and on the other hand because, concerning these things, we do not understand in the same positive way that, in certain respects, they have no limits, but only in a negative way that their limits, if they had any, cannot be found by us. We do not recognize them to be so absolutely perfect, because, though we sometimes observe in them properties that seem to us to have no limits, we do not fail to recognize that this proceeds from the defect of our understanding and not from their nature. We have to observe two things carefully: the first being that we always keep before our eyes that God's power and goodness are infinite, in order that this should make us understand that we must not fear to fail in imagining His works too great, too beautiful or too perfect; but that, on the contrary, we can fail if we suppose in them any boundaries or limits of which we have certain knowledge. We must always keep before our eyes that the capacity of our mind is very mediocre, and that we must not be so presumptuous as it seems we should be if we supposed that the universe had any limits, without being assured of it by divine revelation or, at least, by very evident natural reasons; because it would [mean] that we want our thoughts to be able to imagine something beyond that to which God's power has extended itself in creating the world. . . .
which seems to teach us that the limitations of our reason manifest themselves in assigning limits to the world, and not in denying outright their existence. Thus, in spite of the fact that Descartes, as we shall see in a moment, had really very good reasons for opposing the "infinity" of God to the "indefiniteness" of the world, the common opinion of his time held that it was a pseudo-distinction, made for the purpose of placating the theologians. That is, more or less, what Henry More, the famous Cambridge Platonist and friend of Newton, was to tell him. More starts, naturally, by expressing his admiration for the great man who has done so much to establish truth and dissipate error, continues by complaining about the difficulty he has in understanding some of his teachings, and ends by presenting some doubts, and even some objections. body, that is, to something which is only and solely extension? Is it not better to assume that the soul, though immaterial, is also extended; that everything, even God, is extended? How could He otherwise be present in the world? First, you establish a definition of matter, or of body, which is much too wide. It seems, indeed, that God is an extended thing (res), as well as the Angel; and in general everything that subsists by itself, so that it appears that extension is enclosed by the same limits as the absolute essence of things, which however can vary according to the variety of these very essences. As for myself, I believe it to be clear that God is extended in His manner just because He is omnipresent and occupies intimately the whole machine of the world as well as its singular particles. How indeed could He communicate motion to matter, which He did once, and which, according to you, He does even now, if He did not touch the matter of the universe in practically the closest manner, or at least had not touched it at a certain time? Which certainly He would never be able to do if He were not present everywhere and did not occupy all the spaces. God, therefore, extends and expands in this manner; and is, therefore, an extended thing (res). Having thus established that the concept of extension cannot be used for the definition of matter since it is too wide and embraces both body and spirit which both are extended, though in a different manner (the Cartesian demonstration of the contrary appears to More to be not only false but even pure sophistry), More suggests secondly that matter, being necessarily sensible, should be defined only by its relation to sense, that is, by tangibility. [paragraph continues] But if Descartes insists on avoiding all reference to sense-perception, then matter should be defined by the ability of bodies to be in mutual contact, and by the impenetrability which matter possesses in contradistinction to spirit. The latter, though extended, is freely penetrable and cannot be touched. Thus spirit and body can co-exist in the same place, and, of course, two—or any number of—spirits can have the same identical location and "penetrate" each other, whereas for bodies this is impossible. The rejection of the Cartesian identification of extension and matter leads naturally to the rejection by Henry More of Descartes’ denial of the possibility of vacuum. Why should not God be able to destroy all matter contained in a certain vessel without—as Descartes asserts—its walls being obliged to come together? Descartes, indeed, explains that to be separated by "nothing" is contradictory and that to attribute dimensions to "void" space is exactly the same as to attribute properties to nothing; yet More is not convinced, all the more so as "learned Antiquity"—that is Democritus, Epicurus, Lucretius—was of quite a different opinion. It is possible, of course, that the walls of the vessel will be brought together by the pressure of matter outside them. But if that happens, it will be because of a natural necessity and not because of a logical one. Moreover, this void space will not be absolutely void, for it will continue to be filled with God's extension. It will only be void of matter, or body, properly speaking. of matter, combined with the use of corpuscular conceptions in his own physics. To say that the admission of atoms is limiting God's omnipotence, and that we cannot deny that God could, if He wanted to, divide the atoms into parts, is of no avail: the indivisibility of atoms means their indivisibility by any created power, and that is something that is perfectly compatible with God's own power to divide them, if He wanted to do so. There are a great many things that He could have done, but did not, or even those that He can do but does not. Indeed, if God wanted to preserve his omnipotence in its absolute, status, He would never create matter at all: for, as matter is always divisible into parts that are themselves divisible, it is clear that God will never be able to bring this division to its end and that there will always be something which evades His omnipotence. Henry More is obviously right and Descartes himself, though insisting on God's omnipotence and refusing to have it limited and bounded even by the rules of logic and mathematics, cannot avoid declaring that there are a great many things that God cannot do, either because to do them would be, or imply, an imperfection (thus, for instance, God cannot lie and deceive), or because it would make no sense. It is just because of that, Descartes asserts, that even God cannot make a void, or an atom. True, according to Descartes, God could have created quite a different world and could have made twice two equal to five, and not to four. On the other hand, it is equally true that He did not do it and that in this world even God cannot make twice two equal to anything but four. What he wants is just to avoid the Cartesian geometrization of being, and to maintain the old distinction between space and the things that are in space; that are moving in space and not only relatively to each other; that occupy space in virtue of a special and proper quality or force—impenetrability—by which they resist each other and exclude each other from their "places." Grosso modo, these are Democritian conceptions and that explains the far-reaching similarity of Henry More's objections to Descartes to those of Gassendi, the chief representative of atomism in the XVIIth century.5 Yet Henry More is by no means a pure Democritian. He does not reduce being to matter. And his space is not the infinite void of Lucretius: it is full, and not full of "ether" like the infinite space of Bruno. It is full of God, and in a certain sense it is God Himself as we shall see more clearly hereafter. To the perplexity and objections of his English admirer and critic Descartes replies10—and his answer is surprisingly mild and courteous—that it is an error to define matter by its relation to senses, because by doing so we are in danger of missing its true essence, which does not depend on the existence of men and which would be the same if there were no men in the world; that, moreover, if divided into sufficiently small parts, all matter becomes utterly insensible; that his proof of the identity of extension and matter is by no means a sophism but is as clear and demonstrative as it could be; and that it is perfectly unnecessary to postulate a special property of impenetrability in order to define matter because it is a mere consequence of its extension. object. But I deny that there is in God, in an Angel, in our soul, and in any substance that is not a body, a true extension, such as is usually conceived by everybody. For by an extended thing everybody understands something [which is] imaginable (be it an ens rations or a real thing), and in which, by imagination, can be distinguished different parts of a determined magnitude and figure, of which the one is in no way the other; so that it is possible, by imagination, to transfer any one of them to the place of another, but not to imagine two of them in the same place. Nothing of that kind applies to God, or to our souls, which are not objects of imagination, but of pure understanding, and have no separable parts, especially no parts of determinate size and figure. Lack of extension is precisely the reason why God, the human soul, and any number of angels can be all together in the same place. As for atoms and void, it is certain that, our intelligence being finite and God's power infinite, it is not proper for us to impose limits upon it. Thus we must boldly assert "that God can do all that we conceive to be possible, but not that He cannot do what is repugnant to our concept." Nevertheless, we can judge only according to our concepts, and, as it is repugnant to our manner of thinking to conceive that, if all matter were removed from a vessel, extension, distance, etc., would still remain, or that parts of matter be indivisible, we say simply that all that implies contradiction. distinct ideas. Thus it is not only repugnant to our thought, but impossible that something of which we clearly see that it implies contradiction be real. There are no contradictory objects in this world, though there could have been in another.
. . . an affectation of modesty, but as a precaution, and, in my opinion a necessary one, that I call certain things indefinite rather than infinite. For it is God alone whom I understand positively to be infinite; as for the others, such as the extension of the world, the number of parts into which matter is divisible, and so on, whether they are simpliciter infinite or not, I confess not to know. I only know that I do not discern in them any end, and therefore, in respect to me, I say they are indefinite. And though our mind is not the measure of things or of truth, it must, assuredly, be the measure of things that we affirm or deny. What indeed is more absurd or more inconsiderate than to wish to make a judgment about things which we confess to be unable to perceive with our mind? Thus I am surprised that you not only seem to want to do so, as when you say that if extension is infinite only in respect to us then extension in truth will be finite, etc., but that you imagine beyond this one a certain divine extension, which would stretch farther than the extension of bodies, and thus suppose that God has partes extra partes, and that He is divisible, and, in short, attribute to Him all the essence of a corporeal being. When I say that the extension of matter is indefinite, I believe it to be sufficient to prevent any one imagining a place outside it, into which the small particles of my vortices could escape; because wherever this place be conceived, it would already, in my opinion, contain some matter; for, when I say that it is indefinitely extended, I am saying that it extends farther than all that can be conceived by man. But I think, nevertheless, that there is a very great difference between the amplitude of this corporeal extension and the amplitude of the divine, I shall not say, extension, because properly speaking there is none, but substance or essence; and therefore I call this one simpliciter infinite, and the other, indefinite. Descartes is certainly right in wanting to maintain the distinction between the "intensive" infinity of God, which not only excludes all limit, but also precludes all multiplicity, division and number, from the mere endlessness, indefiniteness, of space, or of the series of numbers, which necessarily include and presuppose them. This distinction, moreover, is quite traditional, and we have seen it asserted not only by Nicholas of Cusa, but even by Bruno. You can hardly ignore that it is either simpliciter infinite or, in point of fact, finite, though you cannot as easily decide whether it is the one or the other. That, however, your vortices are not disrupted and do not come apart seems to be a rather clear sign that the world is really infinite. For my part, I confess freely that though I can boldly give my approval to this axiom: The world is finite, or not finite, or, what is here the same thing, infinite, I cannot, nevertheless, fully understand the infinity of any thing whatsoever. But here there comes to my imagination what Julius Scaliger wrote somewhere about the contraction and the dilatation of the Angels: namely, that they cannot extend themselves in infinitum, or contract themselves to an imperceptible (οὐδενότητα) point. Yet if one recognizes God to be positively infinite (that is, existing everywhere), as you yourself rightly do, I do not see whether it is permitted to the unbiassed reason to hesitate to admit forthwith also that He is nowhere idle, and that with the same right, and with the same facility with which [He created] this matter in which we live, or that to which our eyes and our mind can reach, He produced matter everywhere. I will add that this consequence is perfectly manifest, because the particle "only" (tantum) clearly excludes all real infinity of the thing which is said to be infinite only in respect to us, and therefore in reality the extension will be finite; moreover my mind does perceive these things of which I judge, as it is perfectly clear to me that the world is either finite or infinite, as I have just mentioned.
. . . for, if God annihilated this universe and then, after a certain time, created from nothing another one, this intermundium or this absence of the world would have its duration which would be measured by a certain number of days, years or centuries. There is thus a duration of something that does not exist, which duration is a kind of extension. Consequently, the amplitude of nothing, that is of void, can be measured by ells or leagues, just as the duration of what does not exist can be measured in its inexistence by hours, days and months.
. . . that he does not conceive any extension of substance in God, in the angels, or in our mind, but only an extension of power, so that an angel can proportionate this power to a greater or smaller part of corporeal substance; for if there were no body at all, this power of God or of an angel would not correspond to any extension whatever. To attribute to substance what pertains only to power is an effect of the same prejudice which makes us suppose all substance, even that of God, to be something that can be imagined. I believe that it implies a contradiction to conceive a duration between the destruction of the first world and the creation of the second one; for, if we refer this duration or something similar to the succession of God's ideas, this will be an error of our intellect and not a true perception of something. Indeed, it would mean introducing time into God, and thus making God a temporal, changing being. It would mean denying His eternity, replacing it by mere sempiternity—an error no less grave than the error of making Him an extended thing. For in both cases God is menaced with losing His transcendence, with becoming immanent to the world. It is repugnant to my concept to attribute any limit to the world, and I have no other measure than my perception for what I have to assert or to deny. I say, therefore, that the world is indeterminate or indefinite, because I do not recognize in it any limits. But I dare not call it infinite as I perceive that God is greater than the world, not in respect to His extension, because, as I have already said, I do not acknowledge in God any proper [extension], but in respect to His perfection. It is repugnant to my mind, or what amounts to the same thing, it implies a contradiction, that the world be finite or limited, because I cannot but conceive a space outside the boundaries of the world wherever I presuppose them. But, for me, this space is a true body. I do not care if it is called by others imaginary, and that therefore the world is believed to be finite; indeed, I know from what prejudices this error takes its origin. Henry More, needless to say, was not convinced—one philosopher seldom convinces another. He persisted, therefore, in believing "with all the ancient Platonists" that all substance, souls, angels and God are extended, and that the world, in the most literal sense of this word, is in God just as God is in the world. More accordingly sent Descartes a third letter,25 which he answered,26 and a fourth,27 which he did not.28 I shall not attempt to examine them here as they bear chiefly on questions which, though interesting in themselves—for example, the discussion about motion and rest—are outside our subject. Summing up, we can say that we have seen Descartes, under More's pressure, move somewhat from the position he had taken at first: to assert the indefiniteness of the world, or of space, does not mean, negatively, that perhaps it has limits that we are unable to ascertain; it means, quite positively, that it has none because it would be contradictory to posit them. But he cannot go farther. He has to maintain his distinction, as he has to maintain the identification of extension and matter, if he is to maintain his contention that the physical world is an object of pure intellection and, at the same time, of imagination—the precondition of Cartesian science—and that the world, in spite of its lack of limits, refers us to God as its creator and cause. Infinity, indeed, has always been the essential character, or attribute, of God; especially since Duns Scotus, who could accept the famous Anselmian a priori proof of the existence of God (a proof revived by Descartes) only after he had "colored" it by substituting the concept of the infinite being (ens infinitum) for the Anselmian concept of a being than which we cannot think of a greater (ens quo maius cogitari nequit). Infinity thus—and it is particularly true of Descartes whose God exists in virtue of the infinite "superabundance of His essence" which enables Him to be His own cause (causa sui) and to give Himself His own existence29—means or implies being, even necessary being. Therefore it cannot be attributed to creature. The distinction, or opposition, between God and creature is parallel and exactly equivalent to that of infinite and of finite being. The breaking off of the correspondence with—and the death of—Descartes did not put an end to Henry More's preoccupation with the teaching of the great French philosopher. We could even say that all his subsequent development was, to a very great extent, determined by his attitude towards Descartes: an attitude consisting in a partial acceptance of Cartesian mechanism joined to a rejection of the radical dualism between spirit and matter which, for Descartes, constituted its metaphysical background and basis. [paragraph continues] Plato and Aristotle, Democritus and the Cabala, the thrice great Hermes and the Stoa, it was Henry More who gave to the new science—and the new world view—some of the most important elements of the metaphysical framework which ensured its development: this because, in spite of his unbridled phantasy, which enabled him to describe at length God's paradise and the life and various occupations of the blessed souls and spirits in their post-terrestrial existence, in spite of his amazing credulity (equalled only by that of his pupil and friend, fellow of the Royal Society, Joseph Glanvill,1 the celebrated author of the Scepsis scientifica), which made him believe in magic, in witches, in apparitions, in ghosts, Henry More succeeded in grasping the fundamental principle of the new ontology, the infinitization of space, which he asserted with an unflinching and fearless energy. It is possible, and even probable, that, at the time of his Letters to Descartes (1648), Henry More did not yet recognize where the development of his conceptions was ultimately to lead him, all the more so as these conceptions are by no means "clear" and "distinct." Ten years later, in his Antidote against Atheism2 and his Immortality of the Soul3 he was to give them a much more precise and definite shape; but it was only in his Enchiridium metaphysicum,4 ten years later still, that they were to acquire their final form. attribute of being as such, the necessary precondition of any real existence. There are not, as Descartes asserts, two types of substance, the extended and the unextended. There is only one type: all substance, spiritual as well as material, is extended. On the other hand, Descartes, according to More, fails to recognize the specific character both of matter and of space, and therefore misses their essential distinction as well as their fundamental relation. Matter is mobile in space and by its impenetrability occupies space; space is not mobile and is unaffected by the presence, or absence, of matter in it. Thus matter without space is unthinkable, whereas space without matter, Descartes notwithstanding, is not only an easy, but even a necessary idea of our mind. Henry More's pneumatology does not interest us here; still, as the notion of spirit plays an important part in his—and not only his—interpretation of nature, and is used by him—and not only by him—to explain natural processes that cannot be accounted for or "demonstrated" on the basis of purely mechanical laws (such as magnetism, gravity and so on), we shall have to dwell for a moment on his concept of it. whatever. As for example, I conceive the intire Idea of a Spirit in generall, or at least of all finite, created and subordinate Spirits, to consist of these severall powers or properties, viz. Self-penetration, Self-motion, Self-contraction and Dilatation, and Indivisibility; and these are those that I reckon more absolute: I will adde also what has relation to another and that is power of Penetrating, Moving and Altering the Matter. These Properties and Powers put together make up the Notion and Idea of a Spirit whereby it is plainly distinguished from a Body whose parts cannot penetrate one another, is not Self-moveable, nor can contract nor dilate it self, is divisible and separable one part from another; but the parts of a Spirit can be no more separable, though they be dilated, than you can cut off the Rayes of the Sun by a pair of Scissors made of pellucid Crystall. And this will serve for the settling of the Notion of a Spirit. And out of this description it is plain that Spirit is a notion of more Perfection than a Body, and therefore more fit to be an Attribute of what is absolutely Perfect than a Body is. As we see, the method used by Henry More to arrive at the notion or definition of spirit is rather simple. We have to attribute to it properties opposite or contrary to those of body: penetrability, indivisibility, and the faculty to contract and dilate, that is, to extend itself without loss of continuity, into a smaller or larger space. This last property was for a very long time considered as belonging to matter also, but Henry More, under the conjoint influence of Democritus and Descartes, denies it to matter, or body, which is, as such, incompressible and always occupies the same amount of space. of the manner in which this notion can be determined. Moreover he attempts to introduce into his definition a sort of terminological precision. Thus, he says,6 "by Actual Divisibility I understand Discerpibility, gross tearing or cutting of one part from the other." It is quite clear that this "discerpibility" can only belong to a body and that you cannot tear away and remove a piece of a spirit. As for the faculty of contraction and dilation, More refers it to the "essential spissitude" of the spirit, a kind of spiritual density, fourth mode, or fourth dimension of spiritual substance that it possesses in addition to the normal three of spatial extension with which bodies are alone endowed.7 Thus, when a spirit contracts, its "essential spissitude" increases; it decreases, of course, when it dilates. We cannot, indeed, imagine the "spissitude" but this "fourth Mode," Henry More tells us,8 "is as easy and familiar to my Understanding as that of the Three dimensions to my sense or Phansy." I will define therefore a Spirit in generall thus: A substance penetrable and indiscerpible. The fitness of which definition will be better understood, if we divide Substance in generall into these first Kindes, viz. Body and Spirit and then define Body A Substance impenetrable and discerpible. Whence the contrary Kind to this is fitly defined, A Substance penetrable and indiscerpible. [paragraph continues] Extension and Activity either connate or communicated. For Matter it self once moved can move other Matter. And it is as easy to understand what Penetrable is as Impenetrable, and what Indiscerpible is as Discerpible; and Penetrability and Indiscerpibility being as immediate to Spirit as Impenetrability or Discerpibility to Body, there is as much reason to be given for the Attributes of the one as of the other, by Axiome 910 And Substance in its precise notion including no more of Impenetrability than of Indiscerpibility we may as well wonder how one kind of Substance holds out its parts one from another so as to make them impenetrable to each other (as Matter, for instance does the parts of Matter) as that parts of another substance hold so fast together that they are by no means Discerpible. And therefore the holding out in one being as difficult a business to conceive as the holding together in the other, this can be no prejudice to the notion of a Spirit. I am rather doubtful whether the modern reader—even if he puts aside prejudice and makes free use of his faculties—will accept Henry More's assurance that it is as easy, or as difficult, to form the concept of spirit as that of matter, and whether, though recognizing the difficulty of the latter, he will not agree with some of More's contemporaries in "the confident opinion" that "the very notion of a Spirit were a piece of Nonsense and perfect Incongruity." The modern reader will be right, of course, in rejecting More's concept, patterned obviously upon that of a ghost. And yet he will be wrong in assuming it to be pure and sheer nonsense. entities were represented in plenty in their daily life as well as in their scientific experience. To begin with, there was light, assuredly immaterial and incorporeal but nevertheless not only extending through space but also, as Kepler does not fail to point out, able, in spite of its immateriality, to act upon matter, and also to be acted upon by the latter. Did not light offer a perfect example of penetrability, as well as of penetrating power? Light, indeed, does not hinder the motion of bodies through it, and it can also pass through bodies, at least some of them; furthermore, in the case of a transparent body traversed by light, it shows us clearly that matter and light can coexist in the same place. The modern development of optics did not destroy but, on the contrary, seemed to confirm this conception: a real image produced by mirrors or lenses has certainly a determinate shape and location in space. Yet, is it body? Can we disrupt or "discerp" it, cut off and take away a piece of this image? As a matter of fact, light exemplifies nearly all the properties of More's "spirit," those of "condensation" and "dilatation" included, and even that of "essential spissitude" that could be represented by the intensity of light's varying, just like the "spissitude," with its "contraction" and "dilatation." And if light were not sufficiently representative of this kind of entity, there were magnetic forces that to William Gilbert seemed to belong to the realm of animated much more than to purely material being: "there was attraction (gravity) that freely passed through all bodies and could be neither arrested nor even affected by any. matter, and their motion, as cannot be resolved into mere mechanical power. Among these phenomena unexplainable by purely mechanical forces, of which Henry More knows, alas, a great number, including sympathetic cures and consonance of strings (More, needless to say, is a rather bad physicist), the most important is gravity. Following Descartes, he no longer considers it an essential property of body, or even, as Galileo still did, an unexplainable but real tendency of matter; but—and he is right—he accepts neither the Cartesian nor the Hobbesian explanation of it. Gravity cannot be explained by pure mechanics and therefore, if there were in the world no other, non-mechanical, forces, unattached bodies on our moving earth would not remain on its surface, but fly away and lose themselves in space. That they do not is a proof of the existence in nature of a "more than mechanical," "spiritual" agency. I have not only confuted their [Descartes’ and Hobbes] Reasons, but also from Mechanical principles granted on all sides and confirmed by Experience, demonstrated that the Descent of a stone or a bullet, or any such like heavy Body is enormously contrary to the Laws of Mechanicks; and that according to them they would necessarily, if they lye loose, recede from the Earth and be carried away out of our sight into the farthest parts of the Aire, if some Power more than Mechanical did not curb that Motion, and force them downwards towards the Earth. So that it is plain that we have not arbitrarily introduced a Principle but that it is forced upon us by the undeniable evidence of Demonstration.
. . . if we consider more particularly what a strong tug a massive Bullet, suppose of lead or brass must needs give (according to that prime Mechanicall law of motion persisting in a straight line) to recede from the superficies of the Earth, the Bullet being in so swift a Motion as would dispatch some fifteen Miles in one Minute of an Hour; it must needs appear that a wonderful Power is required to curb it, regulate it, or remand it back to the Earth, and keep it there, notwithstanding the strong Reluctancy of that first Mechanical law of Matter that would urge it to recede. Whereby is manifested not only the marvellous Power of Unity in Indiscerpibility in the Spirit of Nature but that there is a peremptory and even forcible Execution of an all-comprehensive and eternal Council for the Ordering and the Guiding of the Motion of Matter in the Universe to what is the Best. And this phenomenon of Gravity is of so good and necessary consequence, that there could be neither Earth nor Inhabitants without it, in this State that things are. Indeed, without the action of a non-mechanical principle all matter in the universe would divide and disperse; there would not even be bodies, because there would be nothing to hold together the ultimate particles composing them. And, of course, there would be no trace of that purposeful organization which manifests itself not only in plants, animals and so on, but even in the very arrangement of our solar system. All that is the work of the spirit of nature, which acts as an instrument, itself unconscious, of the divine will. If there were no Matter but the Immensity of the Divine Essence only occupying all by its Ubiquity, then the Reduplication, as I may so speak, of his indivisible substance, whereby he presents himself intirely everywhere, would be the Subject of that Diffusion and Measurability. . . .
[paragraph continues] Matter, in that it does not naturally conceive any impenetrability or tangibility in the Notion thereof; and therefore it may as well belong to a Spirit as a Body. Whence as I said before, the Idea of God being such as it is, it will both justly and necessarily cast this ruder notion of Space upon that infinite and eternal spirit which is God. There is also another way of answering this Objection, which is this; that this Imagination of Space is not the imagination of any real thing, but only of the large and immense capacity of the potentiality of the Matter, which we can not free our Minds from but must necessarily acknowledge that there is indeed such a possibility of Matter to be measured upward, downward, everyway in infinitum, whether this corporeal Matter were actually there or no; and that though this potentiality of Matter and Space be measurable by furloughs, miles, or the like, that it implies no more real Essence or Being, than when a man recounts so many orders or Kindes of the Possibilities of things, the compute or number of them will infer the reality of their Existence.
. . . it may be answered, That Distance is no real or Physical property of a thing but only notional; because more or less of it may accrue to a thing when as yet there has been nothing at all done to that to which it does accrue. and degrees, and such like notions, are not real things themselves any where, but our mode of conceiving them, and therefore we can bestow them upon Non-entities as well as Entities. . . . But if this will not satisfie, ’tis no detriment to our cause. For if after the removal of corporeal Matter out of the world, there will be still Space and distance, in which this very matter, while it was there, was also conceived to lye, and this distant Space cannot but be something, and yet not corporeal, because neither impenetrable nor tangible, it must of necessity be a substance Incorporeal, necessarily and eternally existent of it self: which the clearer Idea of a Being absolutely perfect will more fully and punctually inform us to be the Self-subsisting God. We have seen that, in 1655 and also in 1662, Henry More was hesitating between various solutions of the problem of space. Ten years later his decision is made, and the Enchiridium metaphysicum (1672) not only asserts the real existence of infinite void space against all possible opponents, as a real precondition of all possible existence, but even presents it as the best and most evident example of non-material—and therefore spiritual—reality and thus as the first and foremost, though of course not unique, subject-matter of metaphysics.
. . . the demonstration of a certain unmovable extended [being] distinct from the movable matter, which commonly is called space or inner locus. That it is something real and not imaginary, as many people assert, we shall prove later by various arguments. First, it is so obvious that it hardly needs proof, as it is confirmed by the opinions of nearly all the philosophers, and even of all men in general, but particularly of those who, as it is proper, believe that matter was created at a certain time. For we must either acknowledge that there is a certain extended [entity] besides matter, or that God could not create finite matter; indeed, we cannot conceive finite matter but as surrounded on all sides by something infinitely extended. Descartes remains, as we see, the chief adversary of Henry More; indeed, as More discovered meanwhile, by his denial both of void space and of spiritual extension, Descartes practically excludes spirits, souls, and even God, from his world; he simply leaves no place for them in it. To the question "where?," the fundamental question which can be raised concerning any and every real being—souls, spirits, God—and to which Henry More believes he can give definite answers (here, elsewhere or—for God—everywhere), Descartes is obliged, by his principles, to answer: nowhere, nullibi. Thus, in spite of his having invented or perfected the magnificent a priori proof of the existence of God, which Henry More embraced enthusiastically and was to maintain all his life, Descartes, by his teaching, leads to materialism and, by his exclusion of God from the world, to atheism. From now on, Descartes and the Cartesians are to be relentlessly criticized and to bear the derisive nickname of nullibists. Still, there are not only Cartesians to be combatted. [paragraph continues] There is also the last cohort of Aristotelians who believe in a finite world, and deny the existence of space outside it. They, too, have to be dealt with. On their behalf Henry More revives some of the old mediaeval arguments used to demonstrate that Aristotelian cosmology was incompatible with God's omnipotence. it would follow, secondly, that not even divine omnipotence could make it that this corporeal finite world in its ultimate surface possess mountains or valleys, that is, any prominences or cavities. Thirdly, that it would be absolutely impossible for God to create another world; or even two small bronze spheres at the same time, in the place of these two worlds, as the poles of the parallel axes would coincide because of the lack of an intermediate space. Nay, even if God could create a world out of these small spheres, closely packed together (disregarding the difficulty of the space that would be left void between them), He would be unable to set them in motion. These are conclusions which Henry More, quite rightly, believed to be indigestible even for a camel's stomach. Yet Henry More's insistence on the existence of space "outside" the world is, obviously, directed not only against the Aristotelians, but also against the Cartesians to whom he wants to demonstrate the possibility of the limitation of the material world, and at the same time, the mensurability, that is, the existence of dimensions (that now are by no means considered as merely "notional"
determinations) in the void space. It seems that More, who in his youth had been such an inspired and enthusiastic adherent of the doctrine of the infinity of the world (and of worlds), became more and more adverse to it, and would have liked to turn back to the "Stoic" conception of a finite world in the midst of an infinite space, or, at least, to join the semi-Cartesians and reject Descartes’ infinitization of the material world. He even goes so far as to quote, with approval, the Cartesian distinction of the indefiniteness of the world and the infinity of God; interpreting it, of course, as meaning the real finiteness of the world opposed to the infinity of space. This, obviously, because he understands now much better than twenty years previously the positive reason of the Cartesian distinction: infinity implies necessity, an infinite world would be a necessary one. . . . But also those philosophers who did not believe in the creation of matter nevertheless acknowleged [the existence of] Space, such are Leucippus, Democritus, Demetrius, Metrodorus, Epicurus and also all the Stoics. Some people add Plato to these. As for Aristotle, who defined place (Locus) as the nearest surface of the ambient body, he was in this question deserted by a great number of his disciples who rightly observed that in this case he was not in agreement with himself, as indeed he attributed to place properties that could not pertain to any thing but to the space occupied by any body; that is, Equality and Immobility. and the Stoics) acknowledged Space outside the world, or beyond it, whereas those who [believe in] infinite worlds and infinite matter, teach that there is even inside the world an intermixed vacuum; such are Democritus and all the Ancients who embraced the atomic philosophy, so that it seems to be entirely confirmed by the voice of nature that there is διατημά τι χωριζοῦ, a certain interval or space really distinct from mundane matter. As for the posteriors, this is sufficiently known. Whereas concerning the Stoics, Plutarch testifies that they did not admit any void inside the world, but an infinite one outside. And Plato says in his Phaedrus that above the supreme heaven where he places the purest souls, there is a certain Supracelestial place (locus), not very different from the abode of the blessed of the Theologians. overcome, I shall present and reveal all the subterfuges by which the Cartesians want to elude the strength of my demonstrations, and I shall reply to them. I must confess that Henry More's answers to the "principal means that the Cartesians used in order to evade the strength of the preceding demonstrations" are sometimes of very dubious value. And that "the refutation of them all" is, as often as not, no better than some of his arguments. [paragraph continues] From this definition, objects Henry More, it would follow that a small body firmly wedged somewhere between the axis and the circumference of a large rotating cylinder would be at rest, which is obviously false. Moreover, in this case, this small body, though remaining at rest, would be able to come nearer to, or recede from, another body P, placed immobile, outside the rotating cylinder. Which is absurd as " it supposes that there can be an approach of one body to another, quiescent, one without local motion." [paragraph continues] . . . that the preceding definition is gratuitously set up by Descartes and, because it is opposed to solid demonstrations, it is manifestly false. More's error is obvious. It is clear that, if we accept the Cartesian conception of the relativity of motion, we no longer have any right to speak of bodies as being absolutely "in motion" or "at rest" but have always to add the point or frame of reference in respect to which the said body is to be considered as being at rest or in motion. And that, accordingly, there is no contradiction in stating that the selfsame body may be at rest in respect to its surroundings and in motion in respect to a body placed farther away, or vice versa. And yet Henry More is perfectly right: the extension of the relativity of motion to rotation—at least if we do not want to restrict ourselves to pure kinematics and are dealing with real, physical objects—is illegitimate; moreover, the Cartesian definition, with its more than Aristotelian insistence on the vicinity of the points of reference, is wrong and incompatible with the very principle of relativity. It is, by the way, extremely probable that Descartes thought it out not for purely scientific reasons, but in order to escape the necessity of asserting the motion of the earth and to be able to affirm—with his tongue in his cheek—that the earth was at rest in its vortex. That the Cartesian definition of motion is rather a description of place; and that if motion were reciprocal, its nature would compel one body to move by two contrary motions and even to move and not to move at the same time. that the Cartesian definition of motion is repugnant to all the faculties of the soul, the sense, the imagination and the reason. the supposition of the Cartesians that local motion is relative to the place where the body is not, and not [to the place] where it is, is absurd. through some extension, describe a trajectory in this extension which, therefore, does not move. Bodies do not take their places with them, they go from one place to another. The place of a body, its internal locus, is not a part of the body: it is something entirely distinct from it, something that is by no means a mere potentiality of matter: a potentiality cannot be separated from the actual being of a thing, but is an entity, independent of the bodies that are and move in it. And even less is it a mere "phansy,"29 as Dr. Hobbes has tried to assert. Having thus established, to his own satisfaction, the perfect legitimacy and validity of the concept of space as distinct from matter and refuted their merging together in the Cartesian conception of " extension " Henry More proceeds to the determination of the nature and the ontological status of the corresponding entity. "Space," or "inner locus," is something extended. Now, extension, as the Cartesians are perfectly right in asserting, cannot be an extension of nothing: distance between two bodies is something real, or, at the very least, a relation which implies a fundamentum reale. The Cartesians, on the other hand, are wrong in believing that void space is nothing. It is something, and even very much so. Once more, it is not a fancy, or a product of imagination, but a perfectly real entity. The ancient atomists were right in asserting its reality and calling it an intelligible nature. matter), which [attribute] however, is found elsewhere [namely there where no matter is present], and which is independent of our imagination. Indeed we are unable not to conceive that a certain immobile extension pervading everything in infinity has always existed and will exist in all eternity (whether we think about it or do not think about it), and [that it is] nevertheless really distinct from matter. It is therefore necessary that, because it is a real attribute, some real subject support this extension. This argumentation is so solid that there is none that could be stronger. For if this one fails, we shall not be able to conclude with any certainty the existence in nature of any real subject whatever. Indeed, in this case, it would be possible for real attributes to be present without there being any real subject or substance to support them.
. . . that this is the very same means of demonstration as Descartes uses to prove that Space is a substance though it becomes false, in his case, insofar as he concludes that it is a corporeal one.
. . . though he [Descartes] aims at another goal than myself. Indeed, from this argument he endeavors to conclude that the Space that is called void is the very same corporeal substance as that called matter. I, on the contrary, since I have so clearly proved that Space or internal place (locus) is really distinct from matter, conclude therefrom that it is a certain incorporeal subject or spirit, such as the Pythagoreans once asserted it to be. And so, through that same gate through which the Cartesians want to expel God from the world, I, on the contrary (and I am confident I shall succeed most happily) contend and strive to introduce Him back. To sum up: Descartes was right in looking for substance to support extension. He was wrong in finding it in matter. The infinite, extended entity that embraces and pervades everything is indeed a substance. But it is not matter. It is Spirit; not a spirit, but the Spirit, that is, God. [paragraph continues] Enumeration of about twenty titles which the metaphysicians attribute to God and which fit the immobile extended [entity] or internal place (locus). When we shall have enumerated those names and titles appropriate to it, this infinite, immobile, extended [entity] will appear to be not only something real (as we have just pointed out) but even something Divine (which so certainly is found in nature); this will give us further assurance that it cannot be nothing since that to which so many and such magnificent attributes pertain cannot be nothing. Of this kind are the following, which metaphysicians attribute particularly to the First Being, such as: One, Simple, Immobile, Eternal, Complete, Independent, Existing in itself, Subsisting by itself, Incorruptible, Necessary, Immense, Un-created, Uncircumscribed, Incomprehensible, Omnipresent, Incorporeal, All-penetrating, All-embracing, Being by its essence, Actual Being, Pure Act. There are not less than twenty titles by which the Divine Numen is wont to be designated, and which perfectly fit this infinite internal place (locus) the existence of which in nature we have demonstrated; omitting moreover that the very Divine Numen is called, by the Cabalists, MAKOM, that is, Place (locus). Indeed it would be astonishing and a kind of prodigy if the thing about which so much can be said proved to be a mere nothing. How this infinite extended [entity] distinct from matter is One, Simple, and Immovable. But let us consider the individual titles and note their congruence. This Infinite Extended [entity] distinct from matter is justly called One, not only because it is something homogeneous and everywhere similar to itself, but because it is to such an extent one, that it is absolutely impossible that of this one there be many, or that it become many, as it has no physical parts out of which it could be multiplied or in which, truly and physically, it could be divided, or in which it could be condensed. Such indeed is the internal, or, if you prefer, innermost locus. From which it follows that it is aptly called Simple, since, as I have said, it has no physical parts. As for what pertains to those diversities of which a logical distribution can be made, there is absolutely no thing so simple that they would not be found in it. But from the Simplicity its Immobility is easily deduced. For no Infinite Extended [entity] which is not co-augmented from parts, or in any way condensed or compressed, can be moved, either part by part, or the whole [of it] at the same time, as it is infinite, nor [can it be] contracted into a lesser space, as it is never condensed, nor can it abandon its place, since this Infinite is the innermost place of all things, inside or outside which there is nothing. And from the very fact that something is conceived as being moved, it is at once understood that it cannot be any part of this Infinite Extended [entity] of which we are speaking. It is therefore necessary that it be immovable. Which attribute of the First Being Aristotle celebrates as the highest. which is given to our imagination and senses—into their respective Gods; properties that Kant—who, however, with Descartes, missed the indivisibility—was to rediscover a hundred years later, and who, accordingly, was unable to connect space with God and had to put it into ourselves. It is indeed justly called Eternal, because we can in no way conceive but that this One, Immovable and Simple [entity] was always, and will be always. But this is not the case for the movable, or for what has physical parts, and is condensed or compressed into parts. Accordingly, Eternity, at least the necessary one, implies also the perfect simplicity of the thing.
. . . Complete because it does not coalesce with any other thing in order to form one entity [with it]; otherwise it would move with it at the same time as [that thing], which is not the case of the eternal locus. It is indeed not only Eternal but also Independent, not only of our Imagination, as we have demonstrated, but of anything whatever, and it is not connected with any other thing or. supported by any, but receives and supports all [things] as their site and place. does not depend on anything there is a very manifest sign, namely, that whereas we can conceive all other things as destructible in reality, this Infinite Immovable Extended [entity] cannot be conceived or imagined destructible. But that it is Immense and Uncircumscribed is patent, because wherever we might want to imagine an end to it, we cannot but conceive an ulterior extension which exceeds these ends, and so on in infinitum. Herefrom we perceive that it is incomprehensible. How indeed could a finite mind comprehend that which is not comprehended by any limit?
. . . is also untreated, because it is the first of all, for it is by itself (a se) and independent of anything else. And Omnipresent because it is immense or infinite. But Incorporeal because it penetrates matter, though it is a substance, that is, an in-itself subsisting being. Furthermore it is All-pervading because it is a certain immense, incorporeal [entity], and it embraces all the singular [things] in its immensity. It is even not undeservedly called Being by essence in contradistinction to being by participation, because Being by itself and being Independent it does not obtain its essence from any other thing. Furthermore, it is aptly called being in act as it cannot but be conceived as existing outside of its causes. The list of "attributes" common to God and to space, enumerated by Henry More, is rather impressive; and we cannot but agree that they fit fairly well. After all, this is not surprising: all of them are the formal ontological attributes of the absolute. Yet we have to recognize Henry More's intellectual energy that enabled him not to draw back before the conclusions of his premises; and the courage with which he announced to the world the spatiality of God and the divinity of space. As for this conclusion, he could not avoid it. Infinity implies necessity. Infinite space is absolute space; even more, it is an Absolute. But there cannot be two (or many) absolute and necessary beings. Thus, as Henry More could not accept the Cartesian solution of the indefiniteness of extension and had to make it infinite, he was eo ipso placed before a dilemma: either to make the material world infinite and thus a se and per se, neither needing, nor even admitting, God's creative action; that is, finally, not needing or even not admitting God's existence at all. and through which God creates and maintains His world, a finite world, limited in space as well as in time, as an infinite creature is an utterly contradictory concept. That is something that Henry More acknowledges not to have recognized in his youth when, seized by some poetic furor, he sang in his Democritus Platonissans a hymn to the infinity of the worlds. To prove the limitation in time is not very difficult: it is sufficient, according to More, to consider that nothing can belong to the past if it did not become "past" after having been "present"; and that nothing can ever be "present" if it did not, before that, belong to the future. It follows therefrom that all past events have, at some time, belonged to the future, that is, that there was a time when all of them were not yet "present," not yet existent, a time when everything was still in the future and when nothing was real. It is much more difficult to prove the limitation of the spatial extension of the (material) world. Most of the arguments alleged in favor of the finiteness are rather weak. Yet it can be demonstrated that the material world must, or at least can, be terminated, and therefore is not really infinite. is understood to be not only by an infinite eternity older than the World, but also by immense spaces larger and more ample than it. The circle is closed. The conception that Henry More ascribed to Descartes—though falsely—and so bitterly criticized in his youth, has demonstrated its good points. An indeterminately vast but finite world merged in an infinite space is the only conception, Henry More sees it now, that enables us to maintain the distinction between the contingent created world and the eternal and a se and per se existing God. By a strange irony of history, the κενόν of the godless atomists became for Henry More God's own extension, the very condition of His action in the world.